A+++. Great eBayer !!! Item as described. This watch looks brand new, not "reburbished." Great seller. Thank you! Item is better than in the pics. Great deal and seller. Thanks! Quality watch at an outstanding price. Don't be fooled people, this watch may say refurbished, but it was in mint condition. So much so that I feel bad wearing it and scratching the band. It wears comfortably and adjusts to very small wrists, like mine🤫. The clasp works great and it looks much more expensive than what it cost. Very happy with my purchase and recommend to anyone. Obviously, it keeps perfect time but in the process, looks great. The classic blue background and silver hands and indicators make for a stylish design. 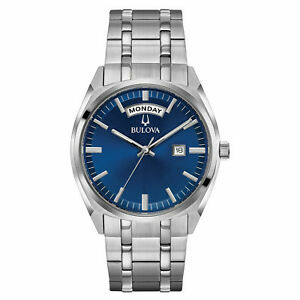 I like the fact that under the 12 is the tuning fork logo which is not seen in many Bulova watches. The metal bracelet is one of the nicest I have encountered. This is a great looking watch. Looks good and keeps excellent time. Great watch at a super price.